Last week I took the park and ride bus from Chessington World of Adventures to Kingston with the intention of doing some Christmas shopping. But almost as soon as I arrived realised this was more of a gluten free recce! Firstly I came across a very tempting little shop called sweet revenge bakery. I gazed longingly through the window wishing desperately that I wasn’t gluten intolerant. I then noticed a sign on the glass announcing that gluten free cupcakes were available at weekends – beyond excited! Sadly it was a Friday and I’m currently avoiding sugar, so maybe just as well! I found @RevengeCupcakes on Twitter and due to popular demand gluten free cupcakes will now be available everyday. Great news! I also checked that the cakes are baked and stored separately, which they are. However they couldn’t guarantee 100% gluten free as they’re prepared using the same kitchen, which is no different from pizza restaurants etc. I will return in the new year to give them ago. I can’t wait! Almost immediately I came across a health food shop foodforthoughtuk.com fully stocked with free from goodies, I was like a kid in a sweet shop! I often visit the sister store in Guildford but was even more impressed with the selection here. Deciding to come back later to stock up, I headed out to the shops. By this time I was starving, remembering that I had read on Bruschetta restaurant‘s website that they supplied fresh gluten free pasta to an eatery in the Bentalls centre, I scurried over to see if I could find it. Centre view restaurant is inside Bentalls itself. Very excitedly I rushed to the pasta section, I couldn’t see a sign but asked anyway. 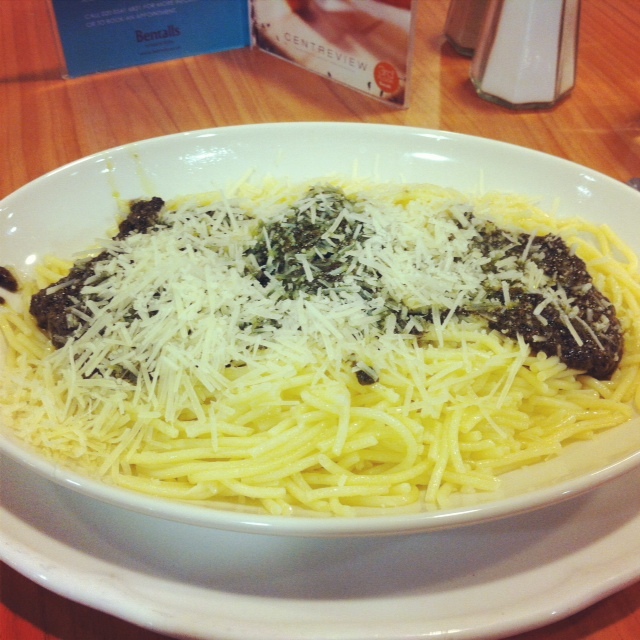 No problem came the answer, I chose spaghetti with pesto and parmesan. Gluten free fresh pasta was not a cheap option at just over £7 especially in a canteen style eatery. But I have to say it arrived quickly and although looked a little unattractive on the plate, tasted incredible. Will definitely return again for lunch next time I’m in Kingston. I also couldn’t help but notice a large sign saying ‘gluten free cakes available’ (also made by Bruschetta restaurant) purely for research purposes I asked what cakes were available, sadly they were all sold out. But was assured that there would be more in the very next day. Temptation number two avoided, phew! This had turned into a real foodie day and with not a great deal of Christmas shopping done I headed back to Food For Thought. Stocking up on GF savoury biscuits, crisps, buckwheat flour and another Organ pizza mix. There was so much more I could have bought, maybe next time! I’ve decided Kingston is my new favourite place to shop and eat.